I have talked about healthy eating and exercising multiple times in my blog. I really believe that healthy eating is a life style you choose and live with for the rest of your life. But at the same time as I grow older I am becoming more realistic. My husband always reminds me that I can’t wish for a miracle with my body. So I am accepting the fact that as I grow older I need to exercise more to stay fit. For the last few months, I have a new goal, getting my body better for our cruise holiday. Keeping that in mind, I changed my exercise routine. I used to normally exercise after work and during weekends but now, it has changed completely. I realised that my one-hour lunch breaks have not been properly utilise. I used to walk in a park but it was not helping a lot so I decided to do intense exercise during that time. Therefore, I do not have to worry about exercise once I am home. I have been running a couple of time a week, swimming a couple of times a week and playing tennis once a week. Some weeks I work out every afternoon while some weeks I do it 3-4 afternoons. Either way my body is getting a good workout during the lunchtime. In addition, I realised once I started exercising regularly, I met other colleagues who exercise during the lunch break as well. Now I have a swimming partner twice a week, in a running group once a week and with a tennis group once a week. Not everyone one makes it every week but still it is so good to go and exercise with likeminded people. I also realised when I run or swim with other people, I tend to push myself further than when I exercise alone. I still exercise alone somedays like today I went running alone as everyone else was doing something else but exercising during lunch time seemes a great idea to me. Now, it has been a few months so if I don’t do something during lunch time, I feel bad. Unless I have a lunch date with someone, which I try to have now and then to socialise, I will go and just run. Also, I have been swimming with my hubby after work once or twice a week and that is also adding up. I love yoga so at least once a week on weekends I am practicing yoga. I don’t have to make excuses after work when I don’t exercise and have more time to think about dinner and other things in our life. My body is slowly but surely getting where I went it to be. Wish me luck that I can keep this routine for a long time. Leaving you with an interesting article from Huffington post by Sarah Klein. Whether you do it to lose weight, to reach a fitness goal or — dare we say it? — just for fun, exercise changes you. 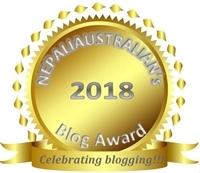 This entry was posted in Health, Personal and tagged australian, exercise, Fitness, Heart rate, intense exercise, M from nepaliaustralian, Muscle, Nepal, Nepali, nepali australian, Nepaliaustralian, Physical exercise. Bookmark the permalink. i am new to your blog and I glad I am glad I found such a nice blog.I try to exercise 3 times a week and try my level best to eat healthy. We get an hour lunch break so if I run, I will run 5km/40 mins, have a quick shower and change. Back at desk in an hour and have lunch while I work. If I swim, I will change, swim for at least 30 minutes (8-10 laps), quick shower and change. I am back at my desk in an hour. When I play tennis, it is the same story. It can be done and intense workout for 30-40 minutes in is better as well. The perk of not exercising after work drives me to do something during lunch. Now I can Skype with my mum more often and spend more time cooking more complicated food when I feel like, Definitely more time during the evening. Wising you a very happy Christmas and wonderful New year !!! I’m addicted gyming too ! 🙂 I have to workout after work because there’s no other way.. but its more like an addiction or a habit now.. I can’t skip. I workout 6 days a week and power yoga or active rest days once. I work different muscle groups on different days incorporated with cardio.. I wish I went more often to swim though but its at another branch of the gym.. BUT how do you workout during lunch break? :O How long is your lunch break! I hate having to sweat and then shower and then .. it just takes too much time no? That sounds like a plan but I need around 2 hours for a proper workout coz I do a lot of weight training and TRX or cross fit.. but its definitely for a pointer for the future. Wish you a great Christmas and a Wonderful New year on board!!! 🙂 hugs and kisses! Thanks Amelia. As you k now I will be cursing soon and it kept me motivated. Hope I will have same motivation when we come back. Wising you a very happy Christmas and wonderful New year !!! I can attest to the fact that the older I get the harder I must workout to stay fit. Eat less, workout more…doesn’t seem fair. “I did my best today. Tomorrow I will do better” Great mantra! I know, it is not fair but what can we do 😦 . I am not giving up yet so working out harder :). Wising you a very happy Christmas and wonderful New year !!! I don’t do anything anywhere near intense, just an exercise bike. I should resume yoga, something I love. Thank you Alisha, I will try to learn how to do sun salutation 🙂 Happy holidays..